← Why copy+pasting text from PDF results in garbage? Batch edit PDF by adding a barcode based on text in the PDF? Question:I receive around 30 work orders a day from my primary client. They send them to me in a standardized report format, in a single PDF, with one page for each different work orders. Unfortunately, these PDF reports don't include the work order_ID in a barcoded format, only in regular text font and they are unwilling to comply to my request to modify the report by adding a barcode. Is there a way to automatically add a barcode to the PDF? basically I would want the PDF editing app to search for the text “work order ID:” and to insert the barcode, beneath the work_order ID. Please advise, VeryPDF. Answer: According to your needs, please have a free trial of software VeryPDF PDF Stamp Command Line, by which you can add barcode stamp in batch easily. By this software, you can also add various stamps to PDF in batch, like image stamp for adding logo, text stamp like adding page number or others. Please know more information of this software on homepage, in the following part, let us check how to use this software. This is command line version software, so we compressed it to zip file. When downloading finishes, please extract it to some folder then you can check executable file and other elements. There is also GUI version of this software but their functions are not totally the same. The GUI version can not be used to stamp PDF by barcode stamp. When you use this software, please refer to the usage and examples of this software. When you need to run the stamping in batch, please use bat file or wild character. By this above command line code template, you can add barcode stamp either on portrait pages and landscape pages. -PDF <input file>:Open an existing PDF file to stamp. 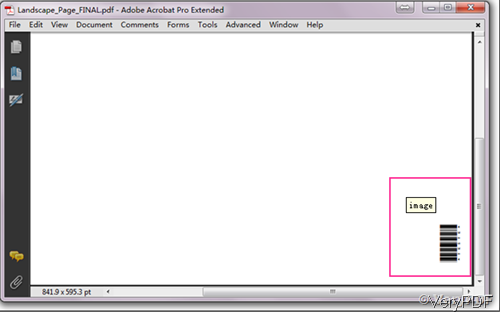 -O <output file>:Write output to a new file, the default is stamp on the input PDF file. -AT: for adding text based stamp. -P5 :Stamps on the Right-Bottom of the page. text or image stamp at any angle. Please check more related parameters on the homepage, during the using, if you have any question, please contact us as soon as possible. Now let us check the barcode stamp effect from the following snapshot. This entry was posted in PDF Stamp and tagged barcode stamp. Bookmark the permalink.